Can young people change the world, or are they stuck with the messy one that adults are planning to hand to them? They are alumni of environmental education programs run by the nonprofit Ecology Project International, which works to educate students about their connections to local and global ecosystems. Inspired by what they have seen and learned, these young people, aged 17 to 25, wanted to apply that passion and those lessons to their own community. The Californios Verdes meet weekly to organize and plan. They have advocated successfully on behalf of a statewide ban on single-use plastics – the cups, straws, bags, and utensils you get in stores and takeout places that then end up in oceans, killing animals, or as microplastics inside of you! These single-use plastics are bad news! Getting lawmakers and business onboard to eliminate them in Baja California Sur is a big deal – the Californios Verdes helped to change the law. One of their favorite projects involves community outreach – they regularly stage events to educate citizens of La Paz about the ecology of the surrounding area, including at the nearby beach Balandra. They help residents – and young people in particular – to understand: Why should we save that mangrove forest, instead of letting developers turn it into a beach resort? Why is the whale shark worth protecting? Conservation of your local wild spaces has to start with a local love and understanding of those spaces. If you and your neighbors aren’t going to stand up for your community and its ecosystems, why would anyone else? The Californios Verdes are online and in the streets, helping their neighbors see the value in protecting the natural world around them. They are ground zero for a grassroots movement that aims to change the world, starting with their own city block in La Paz and radiating outward. The Californios Verdes at Playa Balandra, widely regarded as one of Mexico’s most beautiful beaches. The Californios Verdes routinely work to educate the surrounding community about the importance of protecting this valuable ecosystem. Look, I hear you – life is hard. With homework, parents, maybe a job – it’s busy. And you’re a kid. What have you done this week to make the world a better place? Most Fridays for the rest of the year, you will be working on your very own Public Purpose Project. Your PPP should be something you care deeply about, and it’s something you’re going to be spending a lot of time with – so be thoughtful in your selection. Your main goal is to produce something that leaves your community nicer than you found it. Research, design, and produce a sustainably-sourced line of products that raise awareness of an environmental issue related to your region – think of T-shirts or reusable shopping bags that feature local flora and fauna, reusable water bottles, etc. Consult with your teacher for questions on topics like group sizes, as well as on specific due dates. End of First Quarter: In communication with your teacher, develop a detailed proposal for your project. This proposal should identify a specific need in your community and state a goal. Your proposal should answer basic questions about how you plan to fill that need and achieve that goal. It should set out a detailed timeline for achieving your goal by the end of the school year. Your proposal should also describe resources necessary to carry out your goal, estimated costs of those resources, and any other relevant issues or challenges that you will need to surmount. You should point to other similar projects that have been carried out elsewhere, answering the question: What lessons from that project can I apply to my own? Your report should be delivered in the form of a Google Slide presentation, shared with your teacher and presented to the larger class. Your teacher and peers will offer feedback on your plan. End of Second and Third Quarters: Add new slides to your original presentation. These new slides should update your instructor and peers on the status of your project – How far along are you? What new challenges have presented themselves? How have you addressed those issues? What have you learned? What new questions do you have? How can the group support you? Has your timeline or goal changed in any way? Be sure to include photos, videos, or other documentary evidence of your project in progress. End of Fourth Quarter/School Year: Your goal should be achieved, your project finished. Update your presentation with new slides taking your teacher and peers through the final months of your project. Reflect by addressing the following questions: Were you successful? What did you learn? What would you have done differently? If you were to continue developing this project, how would you extend it? THIS LESSON WAS DEVELOPED WITH SUPPORT FROM ECOLOGY PROJECT INTERNATIONAL. First edition of The Log from the Sea of Cortez by John Steinbeck, 1951. The book describes the complex ecosystem of the Sea of Cortez, its islands, and shorelines. An ecosystem is a community of living organisms interacting with the nonliving components of their environment. Steinbeck describes the wildlife – in particular, the marine invertebrates – in colorful detail, but Sea of Cortez is perhaps most notable for placing humans and human activity firmly into his poetic take on ecology. After all, humans inhabit the Sea of Cortez, they fish in it, they mine the surrounding mountains, their carbon emissions and plastic waste from thousands of miles away effect it – humans should not be considered apart from its ecology. In fact, human activities are a significant factor in almost all of Earth’s ecosystems. The cumulative effects of their impact are large even enough to influence the planet’s climate, or patterns of weather over long periods of time. Ecosystems provide a variety of goods and services upon which people depend. Ecosystem goods include food (fishing, for example), construction material (lumber from forests, sand, stone from quarries, metals from mines, plastics from petroleum pumped from deep under the Earth), and medicinal plants (aspirin, quinine, marijuana). Ecosystem goods also include less tangible items like tourism and outdoor recreation, staples of the economy in many communities around the globe. Ecosystem services, on the other hand, are the many and varied benefits that humans gain from the natural environment and from properly-functioning ecosystems. These include clean air and water (thanks to plants which capture CO2 and aquifers which filter rain water) and crop pollination (by insects and birds). Even things like beauty, inspiration, and opportunities for scientific research, which help humans to better understand our world. whether one “owns” the forest or not. Ecosystem services are what an economist might call a public good – something shared more or less equally by everyone for free. Since they do not cost money, our capitalist system has traditionally placed little value on protecting them – even though they are vital to life as we know it. The Earth can seem huge on a cross country drive that takes days, but it is actually finite. Its natural resources are vulnerable and limited. As human population and per capita consumption grow, so do the demands imposed on ecosystems and the effects of the human ecological footprint – that is, the impact of humanity on the global ecosystem in terms of carbon released, energy used, water consumed, and waste created. Ecosystem services are not only limited but also that they are threatened by human activities. Problems for all ecosystems include: environmental pollution, climate change, and biodiversity loss. For terrestrial ecosystems, additional threats include air pollution (chemicals released by manufacturing and power generation, emission of greenhouse gases), soil degradation (erosion from farming, salinization from irrigation, conversion of ecosystems for human construction projects), and deforestation (especially in tropical and coastal regions). For marine ecosystems threats include unsustainable exploitation of marine resources (overfishing of certain species), marine pollution (from deep sea oil drilling or spills), microplastics pollution (plastic takes thousands of years to biodegrade and too often ends up floating in the ocean), water pollution (from urban runoff and industrial manufacturing), and building on coastal areas. Scientists have been conducting research for decades to help us better understand long-term ecosystem health and its role in enabling human habitation and economic activity. In a capitalistic democracy like the United States – where the priorities of both corporations and government are responsive to the will of the majority of people – it is important for all citizens to understand the findings of these scientists. Each of us must begin to recognize the way our habits of consumption impact on the ecosystems in our region, as well as – in a globalized economy threatened by climate change – ecosystems on the other side of the planet. Humans have the unique ability to shape our environment. This is one thing that distinguishes us from our fellow animals and plants. As we begin to better understand the world around us, we find ourselves confronted with the uncomfortable truth that some of our activities as a species have damaged – and continue to damage – the ecosystems on which all life depends. Modern technology has only enhanced these abilities to shape and to understand – just as it has enhanced our responsibility to create a sustainable future for our species and all others on this planet. 1. 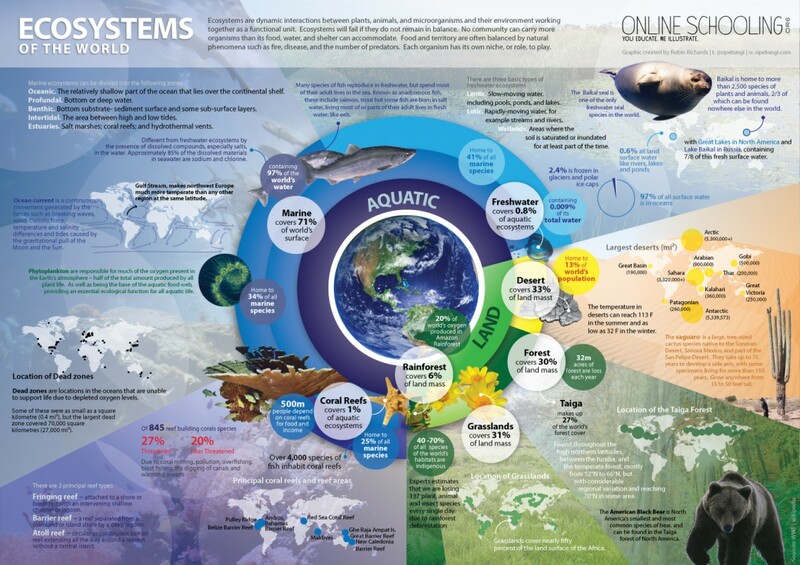 What is an ecosystem? What goods and services do humans extract from them? What negative impacts do human activities have on them? 2. Describe an ecosystem in or near your hometown – name species of plants and animals, identify the substrate and topography, the temperature, rainfall, etc. How have humans shaped this ecosystem and for what reasons? 3. In your own words, what does Steinbeck mean when he says “None of it is important or all of it is?” Do you agree with this sentiment? 4. Amongst life on Earth, human beings possess a unique level of self-awareness, as well as an unparalleled ability to shape every ecosystem on the planet for better or worse. Does that power come with any responsibility? Defend your answer. Trace your impact outward into the environment — list and categorize all of the (a) trash (paper, plastic, metal, recyclable or not), (b) carbon emissions (from electricity use, transportation, ordering things off of Amazon, etc), and (c) food/water (including showers, toilet flushes, and the sprinkler on your lawn) you consumed today. Be thorough and precise. Quantify each of these impacts — weigh them, measure them, use information from the internet to estimate them. There are many tools online that can help you to calculate these numbers. Represent this information in charts or diagrams. In a reflective essay: Which of these impacts can you reduce through personal choices? What challenges or barriers to change will you encounter? Which of these impacts can only be reduced through government or corporate action? Identify three concrete steps you will take to reduce your ecological footprint. Describe exactly how you plan to take these steps. Resolve to carry them out for the next month. “the Fugitive Slave Law of 1850 penalized officials who did not arrest an alleged runaway slave, and made them liable to a fine of $1,000 (about $29,000 in present-day value). Law-enforcement officials everywhere were required to arrest people suspected of being a runaway slave on as little as a claimant‘s sworn testimony of ownership. The suspected slave could not ask for a jury trial or testify on his or her own behalf. In addition, any person aiding a runaway slave by providing food or shelter was subject to six months’ imprisonment and a $1,000 fine. Officers who captured a fugitive slave were entitled to a bonus or promotion for their work. You’ve probably grown up seeing political ads on TV. Most of these are sponsored by PACs or Political Action Committees – groups that aren’t candidates in an election, but wish to influence the outcome with money spent on advertisements. Imagine that TV and PACs existed in 1850. Create a television spot either opposing or supporting the Compromise of 1850. In your ad, be sure to explain the components of the compromise. Also mention the alternatives – do you have a better plan, or are there alternatives worse than the unpalatable elements found in the compromise. Be creative, but in order to get 100% on this assignment, in addition to taking an editorial point of view, you will need to include lots of rich historical details, such as who in Congress supports this compromise, who opposes it, and why.TV ads should be one to two minutes in length. They may be filmed and uploaded to YouTube or performed in class. For writing (Approximately 250 words): In politics, is it better to compromise to solve disputes, even if that compromise is ugly, or is it better to “stay the course” – sticking to your beliefs about what is right, no matter what, even if it means greater conflict and division? Make sure that your answer uses historical examples such as the Compromise of 1850. All of these fighters have monuments – why not someone else? You will compose a persuasive essay – including a brief biographical overview, an explanation of the reformer’s accomplishments/lasting legacy, a direct quote from your reformer’s writings (if available), and a clear argument for why this person deserves to be the face of the 20 dollar bill. You should also provide a suitable portrait for use on the bill. Make sure you cite your sources! Pretend that it is June 8, 1845 – former President Andrew Jackson (1829-1837) has just kicked the old hickory bucket. You’ve been tasked with writing a eulogy for Andrew Jackson. Nowadays, speakers tend to be pretty polite in eulogies, but back then, people weren’t afraid to speak ill of the dead. Even Andrew Jackson’s pet parrot, Polly, had to be ejected from his funeral for swearing. No joke. Make sure to address the significance of (1) annexation of Florida from Spain, (2) the Trail of Tears, (3) the fight over the National Bank, and (4) one other life event of your choosing. Your job is to explain these key accomplishments of his career – and why they are/were controversial. You must then summarize your position – is this man one of our greatest presidents, worthy of bronze statues and twenty dollar bills, or one of our worst, worthy of quiet obscurity and George Bushes? The end result should be a short (3-5 minute) funeral oration addressing the above topics using specific facts and figures to advance your argument – to be recited aloud to stirring effect! Feel free to include period appropriate curse words to make your point, as a tribute to his parrot.